This clip features a short interview with Junji Ito, conducted by British japanophile Christopher Jonathan Ross. I've heard of his show Japanorama previously when he interviewed Junko Mizuno, but I've never seen it. Despite being sort of lamely "ISN'T JAPAN STRANGE AND UNUSUAL!?" in tone, the show (over its three series to date) covers pretty interesting stuff, usually before it's become played out in western media. This interview comes from the Kaidan episode (which also features an interview with Takashi Shimizu)and was posted on YouTube earlier this year. Ito's pretty taciturn but it's still a rare chance to see a video of one of my absolute favorites online. Check it out! 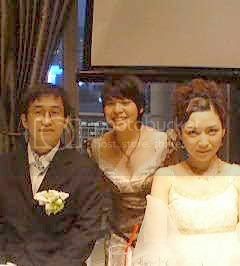 And since we're on the subject, here is a picture from a year or two ago of Junji Ito's wedding! I can't remember her name, but his wife (right) is a manga artist too, I hear. It's Jonathan Ross, not Christopher! Love the blog, btw. Many thanks for what you are doing! Whoops! I think I put Christopher because the dude looks like Christopher Hitchens, haha. Sorry if I sounded like a pedant. Watching Japanoram - and this piece - was the first time I heard of Junji Ito. I was immediately interested - and of course I found out how wonderfuk Ito's work is. And that somehow led me to Same Hat. "Despite being sort of lamely "ISN'T JAPAN STRANGE AND UNUSUAL!?"" "And you thought Kazuo Umezu Chuck Taylors were STRANGE"
@mark...well, SNAP. haha. But then again-- my take is that Converse All-Stars covered with Makoto-chan's snotty face ARE strange, while completely treating THE NATION OF JAPAN and ITS PEOPLES as a mysteriously, uniquely-inscrutable bag of oddness are two different things.